Based at Noida, Uttar Pradesh, India, we, “Caliber India,” are leading manufacturers and exporters of a huge variety of elegantly designed Leather Jackets and Accessories. 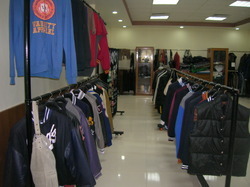 Our range includes a complete line of Varsity Jackets, Sports Jackets and Women's/Men's Jackets that are provided with Embroidery and Monogramming. High on every aspect of look, appeal and style, our garments are skin friendly and offer full comfort level to the wearer. In addition to this, we also offer an impressive assortment of Embroidered Patches and Chenille Patches, which are widely appreciated for their unique designs and patterns. Our organization is registered with the State Government Office and is equipped with outstanding resources and facilities to meet the bulk requirements of the customers. 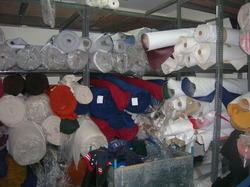 By leveraging our wealth of experience and expertise, we ensure that our customers receive only premium quality and assortment in terms of fabric, color, stitching and trimming. The affairs of our company are proficiently managed by our mentor, Mr. Bahadur, who holds in-depth expertise of this fashion industry. Under his able guidance, we have achieved excellence in the export business and have been able to achieve a renowned position in the Fashion Industry. We are an eminent manufacturer and exporter engaged in offering a wide variety of Leather Jackets, Embroidered Patches and Chenille Patches, which are available in a variety of appealing designs and styles. To meet the requirements of varied customers, we offer our products in varied colour combinations and sizes. Appreciated for their perfect cuts, styles and proportions, these can be availed from us at competitive prices. 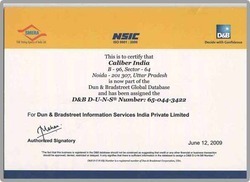 This is to certify that Caliber India is now part of the Dun & Bradstreet Global Database. We are well aware that ''Fine fabrics make the finest garments,'' therefore we utilize the best available raw material in designing our entire assortment. Only superior quality Wool, Vinyl, Leather, Threads and other allied material is used, which are sourced from authentic vendors of the market. In addition to this, we also make sure that our products are designed in line with the latest fashion trends in terms of shades, cut and styles. Banking on our abilities, we manufacture some of the finest garments that make their own style statement besides raising the standard of the market. We are empowered with creative and experienced professionals, who are well versed with the requirements of the Fashion and Garment Industry. By leveraging their rich industrial experience and expertise, they understand the emerging tastes and preferences of the global customers and try to design an impressive assortment, which is capable of enhancing the appeal of the wearer. With an aim to become one of the largest manufacturer and exporter of garments, we ensure the supply of best quality products through a blend of evolved infrastructure, human resources and impressive marketing channels. We are committed to maintain good customer relations and meet their specific requirements. We firmly believe in giving our esteemed clients the true value for their money. Our approach has not only helped us retain our clients over the years but also assist us expand our market.